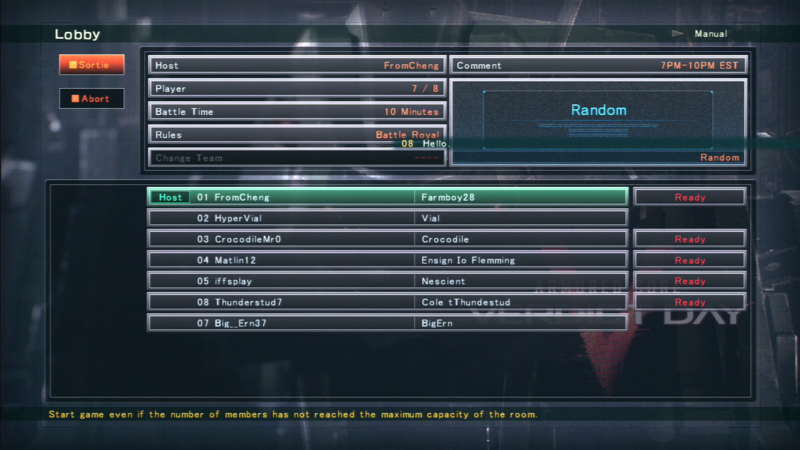 Weekly ACVD stuff on the PS3 side. Whenever I hold one of these I will post up the image with info on dates and times. Currently trying to plan it to be frequent but due to some stuff that'll be happening the next few months it may be sporadic. I will try to notify folks a week before it happens though. Game Time this week. Team Battles. ill be instigating free battle around this time daily for the next few weeks. We had a full house tonight. GGs to everyone. Next Game Time will be on the 31st. Cheng, is there a chat on PSN/Skype/Discord which players join when taking part in these get togethers? Silence rogaine. Whatever gave you such blasphemous ideas? You, iffs, have inspired such blasphemous ideas within my deranged cranium with your completely unrelated activities in unrelated threads. Prolly not. Game Time usually has a large amalgamation of players, most who aren't super active on any of the above mentioned. GGs and thanks to everyone who came out to today's Game Time. Next Game Time will be next Saturday, from 2 to 5 PM EST. Heavily armored Tank ACs with powerful weapons. How many rooms are we going to have? Or is it just by necessity? Only 1. Haven't really had a case where we needed more. GGs and thanks to everyone who came out today. We consistently had a full room and alot of people joining up. We'll be considering having more rooms open in future Game Times. For next week Rogan will be hosting rooms in my place. Quick reminder that Rogan is doing Game Time tonight. Game Time next week will be held by Jinnindo. Next Game Time is a double date: February 3rd and 4th. GGs and thanks for everyone who came out. Next Game Time is tomorrow (see post above). Next Game Time is February 11th. Next Game Time will be on both the PS3 and 360 side. QUICK UPDATE: PS3 Side Game Time Will Be Held By SashPerennial due to family stuff on my end. Game Time next week is on Friday.